When Egypt's Lower House convened on Jan. 23, Islamists held 360 out of its 498 seats, or 72 percent. This astounding figure, however, reflects less the country's public opinion than it does a ploy by the ruling military leadership to remain in power. In a recent article ("Egypt's Sham Election," Dec. 6) we argued that just as Anwar El-Sadat and Hosni Mubarak in the past "tactically empowered Islamists as a foil to gain Western support, arms, and money," so do Mohamed Tantawi and his Supreme Council of the Armed Forces (SCAF) "still play this tired old game." 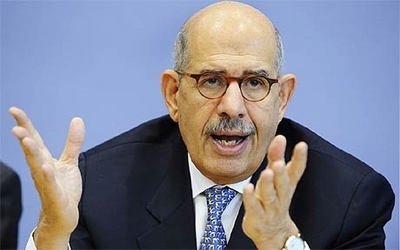 Mohamed ElBaradei left the presidential race complaining about its fraudulent quality. We offered three proofs for this assertion: (1) local electoral deceits; (2) the SCAF offer of a "deal" to the Islamists; and (3) the military having subsidized Islamist political parties. Seven weeks later, various signs point to fraud on a far grander scale. The Free Egyptians Party, Egypt's leading classic liberal political party, announced on Jan. 10 that it had filed more than 500 complaints about Lower House elections "but no legal action was taken" in response. The party pulled out of forthcoming Upper House elections because "violators are awarded with electoral gains and those abiding by the laws are punished" and called for their cancelation. Mohamed ElBaradei, former director general of the International Atomic Energy Agency (IAEA) withdrew his candidacy for president on Jan. 14 because of his perception of rigged elections: "My conscience," he announced, "does not permit me to run for the presidency or any other official position unless it is within a real democratic system." 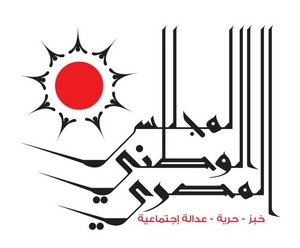 Logo of the Egyptian National Council. Its slogan: "Bread - Freedom - Social Justice." Six parliamentary candidates filed official complaints against a range of officials and demanded that the elections be annulled and redone, reports the newspaper El-Badil in its Jan. 10 edition. One of the candidates, a Wafd Party candidate named Ibrahim Kamel, explained how he acquired government documents indicating that fewer than 40 million Egyptians were eligible to vote, while the current elections included 52 million voters, implying 12 million fraudulent ballots. This increase was achieved, he said, by taking the names and identification numbers of legitimate voters and duplicating them between 2 and 32 times in other electoral precincts. Mamdouh Hamza, head of the Egyptian National Council, an NGO, confirmed this tampering to El-Badil, dubbing it "the biggest crime of fraud in Egyptian history." He demanded that the Lower House elections be redone from scratch. In contrast, the victorious Islamists, who despise democracy, made little effort to conceal their electoral success through fraud. Some of them went so far as proudly and unapologetically to assert that it's their Islamic duty to be dishonest. Tal'at Zahran, a leading Salafi, called the democratic system "infidel," "criminal," and "out of the [Protocols of the] Elders of Zion." He cynically observed that "it is our duty to forge elections; God will reward us for this." 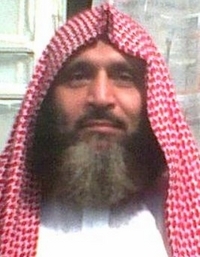 Tal'at Zahran, wearing Arabian (not Egyptian) clothing, signaling his Salafi outlook. Revealingly, Zahran also praised Tantawi: "Just as we gave Mubarak the bay'a [Islamic oath of loyalty], we now support SCAF. If Tantawi decides to stay in power, we will support him until the day he dies." Reports indicate that Islamists and the military are working smoothly together on such key matters as military autonomy and amending the 1971 constitution. Their cooperation makes sense, for Islamists seek Muslim unity so as to focus full attention on the infidel enemy (especially Jews and Christians). With so much evidence of fraud at hand, it bewilders us that Western politicians, journalists, and scholars continue to see the shoddy results of the just-concluded Egyptian elections as a valid expression of popular will. Where are the cynical journalists casting doubt on the Salafis coming from nowhere to win 28 percent of the vote? Why do hard-boiled analysts, who see right through rigged elections in Russia and Syria, fall for "the biggest crime of fraud in Egyptian history"? Perhaps because they give Cairo a break on account of its having cooperated with Western powers for nearly 40 years; or perhaps because Tantawi rigs more convincingly. Given SCAF's explicit disdain for the election results, we are also surprised that analysts expect these significantly to bear on the country's future. In fact, SCAF manipulated the recent elections for its own benefit; Islamists are pawns in this drama, not kings. We are witnessing not an ideological revolution but a military officer corps staying dominant to enjoy the sweet fruits of tyranny. Mr. Pipes (DanielPipes.org) is president of the Middle East Forum and Taube fellow at the Hoover Institution. Ms Farahat (CynthiaFarahat.com) is an Egyptian activist and co-author of a book about the Tahrir Square protests. © 2012 by Daniel Pipes and Cynthia Farahat. All rights reserved. Jan. 24, 2012 addendum: This is the second co-authored with Cynthia Farahat looking at Egypt's fraudulent elections. The prior one covered the first round of parliamentary elections ("Egypt's Sham Election"). July 11, 2012 update: Cynthia Farahat and I return to the topic of fraudulent elections, this time concerning the presidency, in "Egypt's Real Ruler: Mohamed Tantawi."